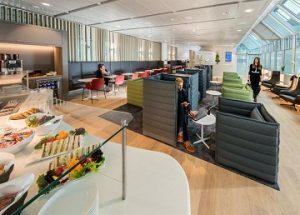 One of the popular lounges at Munich Airport has a brand new look. Following extensive renovations, the former Europa Lounge reopened under the name Airport Lounge Europe. The refurbished facility, featuring a transparent layout and clear, open structures, offers seating for 44 persons and has a total floor space of 200 square meters. Guests have a buffet and bistro area to choose from, a range of TV viewing options and print media, and other amenities. Travellers departing for destinations in the Schengen zone can reach the redesigned relaxation zone via an entrance situated after the security screening checkpoints in Terminal 1 Module D. The new lounge is open to all passengers daily from 6:00 am to 9:00 pm. The hours may vary by season. The EUR 29.75 charge for using the lounge can be paid by ec or credit card.